There’s nothing better than going underwater to see life underwater. Nowhere else can you interact with fish, swim with sea turtles, and even spot rare creatures, like a seahorse or jellyfish (depending on where you swim, of course). If you’re a scuba diver, you relish these opportunities to learn a little more about life under the sea. There comes a point though when it’s in your best interest to make an investment and buy scuba gear rather than rent it. But why should you? Is it worth it even if you don’t get to dive that often? Learn more about the benefits of having your own gear and how it can make the experience that much better. When you consider the obvious fact that you’re sharing scuba gear with other people, including folks you’ve never met, buying seems like the best choice. This alone is enough to make most people agree to invest in their own items. A wet suit that fits over the most personal areas of your body, including scuba masks, aren’t always cleaned properly after each use. If you’re like most folks, you’re scuba diving on your vacation and don’t want to end up sick. But consider the fact that bacteria can come from the very waters you swim in. Swimming in polluted waters makes it easy to contract stomach bugs, GI upsets, and even viruses. In the cases of beaches and oceans, these waters aren’t treated the same way a pool would be. Combined with the fact that you’re renting equipment, it’s even easier to get sick. Buying your own scuba gear means you can get it cleaned after each adventure. You’ll feel safe knowing that no matter how deep or far you swim out, you’re in items that were recently sanitized, and safe to use. Scuba diving is not a cheap hobby. Even if you’re a skilled swimmer, you need special lessons that help you know what’s involved in scuba diving and what to do when underwater. Add to the fact that you need to rent scuba gear each time you want to go underwater, and it starts costing even more. Even if you don’t go scuba diving a lot every year, you’ll cut back on costs by having your own items. You’ll never worry about a rental store running out of something you need. Changing plans and rearranging your activities are a thing of the past when you can grab your own gear and get to swimming. Buying scuba gear requires a slight investment, but it means you can indulge more often without paying extra each time you want to dive under the sea. If you want to get serious about your adventures or just like to be frugal, consider this the first step in saving money while doing what you love. When you wear your own clothes, you feel comfortable. Nothing pinches or is too loose. In short, it feels familiar and safe. Don’t you want to feel the same way when you’re busy investigating the ocean? For many people, wearing something different feels distracting and even uncomfortable. The same applies when you have gear that you’re renting instead of using your own. Once you slide into your scuba gear, you can get right into enjoying your time under the water. There’s no need to try and make something fit, or worse yet, change into an item because the one you initially tried doesn’t work for you. Even better, you can tell your items apart from what others have. If you worry about things getting lost, having your own items and storage to accompany them makes it easier. YourBagTag offers a variety of fun tags to pick from that go great with scuba equipment. When you’re going underwater often, it’s important to ensure all equipment and clothing is properly maintained. Things can decline in quality the more time they spend underwater. If you rent items, you’ll never know how old it is, how often it gets cleaned, or if it was giving someone else problems the last time they used it. You can avoid these issues when you choose to buy your item items. You’ll have something brand-new the next time you go diving. If you’re careful and like to keep records, you’ll know exactly how many uses you’ve gotten from the item, and when to replace it. If you get worried about using something that someone else had or having an issue while you’re underwater, buying your own scuba gear is the best choice for safety, quality, and your own personal enjoyment. If you want to feel secure while doing what you love, make the choice to invest in your own items. It’s time to buy scuba gear of your own if you want to get serious about your sport and enjoy every single minute of it. 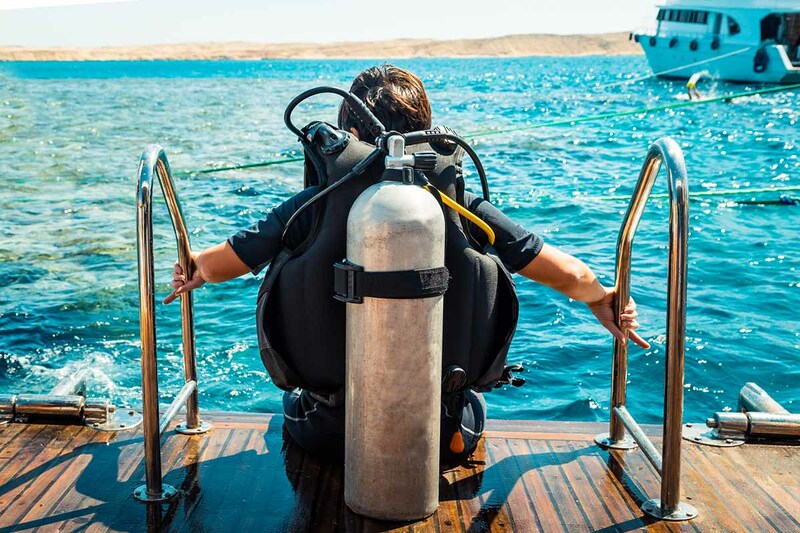 From improved cleanliness to safety while you’re on an adventure, this is the best way to make the most of enjoying scuba diving while staying safe. Like the idea of going underwater but not ready to scuba dive? Check out everything you need to know about snorkeling if you’re a beginner. Plan to go traveling to new places with your scuba gear in tow? See our guide about travel hacks so you can spend more time having fun!